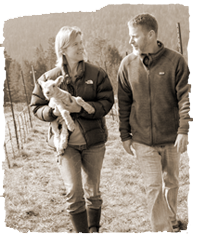 Jason and Molly Drew started Drew in 2000 with a clear pursuit in mind: to craft small lot, cool climate wines that express site distinction and traditional varietal character. Their moment came when they stumbled upon an old 26 acre apple orchard within the Mendocino Ridge Appellation. The Mendocino Ridge is the westernmost AVA within Mendocino County, located directly west and south west of Anderson Valley and directly north of the true Sonoma Coast. This true diamond in the rough was exactly what they were looking for. While others saw a daunting project in this old forgotten orchard property, Jason and Molly saw ancient oceanic soils, south facing slopes sitting at 1250 ft elevation, putting them just above the fogline and a true coastal climate, with the ocean a mere 3.3 miles away. It didn't take long for them to decide to leap and leap they did. They spent 2004 drawing and planning their boutique winery, while 2005 was spent building the winery while living in a 19 ft Airstream trailer along with their two young boys. They eventually planted their 7 acre estate Pinot Noir vineyard in 2011 to several California Heritage, suitcase selections and Dijon selections of Pinot Noir. Jason is a true craftsman having spent many years honing his skillset in vineyard farming and winemaking, having studied in both the northern and southern hemispheres, in Agroecology, Viticulture and a Graduate Degree in Enology from the University of Adelaide. He has worked for several noteable northern and central California estate wineries and vineyards including St Supery alongside Kirk Grace, Joseph Phelps with Craig Williams, Luna with John Kongsgaard, Carmenet with Jeff Baker, Corison with Cathy Corison and Babcock Vineyards with Brian Babcock, totalling 28 years in the industry. They currently bottle two estate Pinot Noir bottlings from the Drew Ranch along with single vineyard bottlings from the Morning Dew Ranch , the Wendling Vineyard, the Joshua's Vineyard and the Valenti Ranch. The two estate bottlings include the Estate Field Selections Pinot Noir and the Estate Mid-Slope Pinot Noir. They also produce two single vineyard cool climate Syrahs from both the Valenti Ranch and the Perli Vineyard in the Mendocino Ridge AVA. The Drew Ranch is farmed to the organic standard continuing a long history of organic farming on their ranch that dates back 30 years. Single vineyard sources are chosen for their climate, clonal selection and complexity of soil type as well as a commitment to meticulous and sustainable farming practices. Winemaking practices remain focused on traditional methods that include whole cluster and native yeast fermentations, hand punchdowns and in most instances, no fining or filtering.